The New Yorker is perhaps a little rough around the edges but certainly a lot of fun. It would make a cracking little club kit or an great first set for a younger player. Good value. Beautifully singing toms. Fiddly bass drum pedal mounting system. Some build issues. Since the popularity of Sonor's Jungle Kit in the 1990s, there has been an ongoing demand for scaled-down kits. In more recent years Ludwig released the Questlove signature BreakBeats kit, and now we see PDP getting in on the act with the New Yorker. 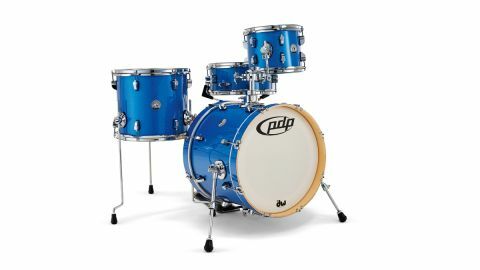 The PDP New Yorker is presented in just one size configuration: 10"x8" rack tom, 13"x12" floor tom, 13"x6" snare and 18"x14" bass drum, and is available in two sparkle wrap finishes. These are Diamond sparkle and Sapphire sparkle (as reviewed). The New Yorker's mission statement is to offer a high quality mini kit with features such as the Teardrop Mini lugs at an entry-level price point. At just £509 the New Yorker is tantalisingly priced, but there are a couple of issues that quickly rear their heads. We refer to the sometimes crudely overlapping sparkle wrap and the odd unsanded surface. Aesthetically not ideal, but when you're talking about a kit for just over 500 notes there are sacrifices that will need to be made. On the plus side for the New Yorker, the L-Rod tom mount features a ball-and-socket joint which allows easy adjustment. The kit also has an extra in-built clamp on the tom arm which allows the use of extra hardware, like a cymbal boom arm. Moving on to the bass drum pedal mounting system, the kit is supplied with a metal arm and welded baseplate that is designed to attach to a wing nut on the bottom of the bass drum (much like a floor tom leg). This is of course necessary to ensure the beater can strike the centre of the drum. We must admit though, we find it to be an unusual solution. It takes longer than expected to get it set up perfectly to the point where any pedal tilting is eliminated. "We had fun playing this kit and liked it. The sparkle finish also grows on us every time we look at it." Out of the box the New Yorker's 18"x14" bass drum sounds a little, to our ears, um... boxy. No amount of tuning and re-tuning can get it sounding how we expect it should. Using the provided dampening pillow strip against the batter head certainly seems to help in concentrating the sound and reducing unwanted overtones, though. As is the usual story, replacing the stock heads would inevitably be a good idea and will usually help to improve the sound dramatically. There were no such problems with the toms, which were able to absolutely sing at medium to high tunings, with the poplar shells yielding a surprising amount of resonance for small, albeit deep drums. We did, however, find the floor tom fiendish to tune. Perhaps there is a special knack to 13" floor toms. Either that or it just takes a bit more finesse in comparison to the standard 16". The snare, like the bass drum, is harder to get an agreeable sound from. Even cranked as tight as it will go, it does not quite reach the snap that we are looking for, but we can't deny that it certainly gets the job done (especially considering its meagre price). Admirably, it also refuses to choke-out under pressure and delivers a sweet, snare-heavy backbeat. This is helped by the throw-off system which has the ability to sit between an on and off position - always a winner in our book. We had fun playing this kit and liked it. The sparkle finish also grows on us every time we look at it. It is perhaps not quite for us but it is potentially perfect for a youngster or perhaps a street player or busker, and you can't argue with the price tag.